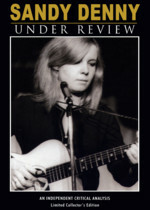 Sandy Denny - Under Review is a documentary film reviewing the music and career of arguably Britain's finest ever female vocalist and songwriter. Although Sandy Denny is revered deeply amongst fans of folk music and the “singer-songwriter” genre, she has never reveived the universal acclaim so long overdue and so often heaped on those of far lesser talent. This program attempts to redress this imbalance and reveal why she remains such an inspiration to so many.